Krios - Cortech Solutions, Inc. 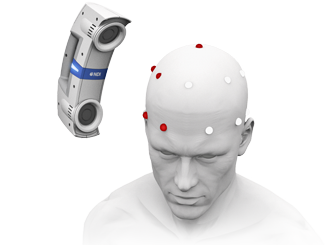 The Polaris® Krios handheld digitizing scanner can be used to measure, identify, and map electrode positions (via attached markers) in EEG, MEG, NIRS, PSG, and ECG tests. The Polaris Krios is based on optical 3D measurement technology that scans up to 256 markers in less than 2 minutes to accuracy within 0.5 mm and repeatability of 0.1 mm. Real-time compensation for data variability ensures only actual markers are measured for mapping and registration purposes. Operate the Krios with ease – its balanced one-hand grip, handy start/stop trigger button, color-coded LED status indicator lights, and audio cues maximize scanning efficiency. Improve the detection of obstructed electrodes and electrode positioning with one-touch localization and registration of fiducial points such as the nasion, inion, and preauricular points. Scan right away – self-calibrating markers attach to any sized or shaped electrode, in any order. No position calculations or sequencing are required. Marker positions are automatically mapped. Capture marker positions to accuracy within 0.5mm and a repeatability of 0.1mm. Only actual markers are measured for electrode mapping purposes. Save significant electrode registration time – up to 256 markers can be scanned in less than 2 minutes. Markers are then automatically mapped and registered. The Polaris Krios is based on optical measurement technology; the scanner uses light reflected by markers to determine their position coordinates. 1. 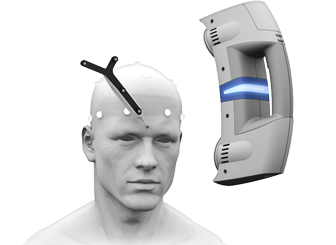 Attach each electrode (with prefixed marker) to the scalp or cap. 2. Scan the head with the Krios to localize each marker’s position. This localization process creates a digital point cloud (3D model) and rigid body of marker coordinates. 3. 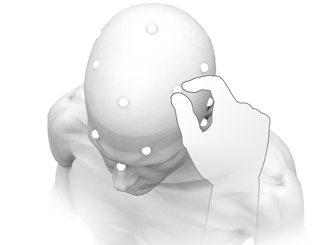 Probe anatomical features to establish fiducial (reference) points with respect to the rigid body, such as the nasion, inion, and preauricular points of the subject’s head. The rigid body is transformed from the Krios coordinate system to the subject coordinate system. Using the Krios software, operators can append notes to electrode positions. The final point cloud with all identified marker coordinates, fiducial points, and notes, is saved as a .CSV file for export to the signal analysis software. The point cloud can then be mapped to a pre-defined electrode configuration within the signal analysis software.